Note: As of this writing the Quonset Air Museum in Rhode Island is currently closed, and its future is uncertain. All artifacts have been placed in storage. Remains of the tail section of the Olympian; the first human-powered airplane to fly in America. There was an interesting display at the Quonset Air Museum that included a rare artifact relating to New England’s aviation history – a portion of the tail section of the Olympian; all that remains of the first human powered aircraft to fly in America. The story of the Olympian began in the 1960s, when an English businessman announced that he would award a large cash prize to the first person who could fly a completely human-powered aircraft in a figure-eight around two pylons set a half-mile apart. As of 1974 the prize money was still unclaimed. Enter Joseph A. Zinno of North Providence, Rhode Island, a retired U.S. Air Force pilot who served in three wars. He became intrigued with the idea of human-powered flight, and after careful study, decided to build his own human-powered airplane. The result was the Olympian, constructed in a former World War II aircraft hangar at Quonset Point, Rhode Island. The Olympian represented 7,000 man-hours of careful labor. It consisted mostly of balsa wood covered with a clear light plastic. The aircraft was 21 feet long, had a wingspan of 78 feet, 6 inches, weighed 150 pounds, and a propeller powered by bicycle components. 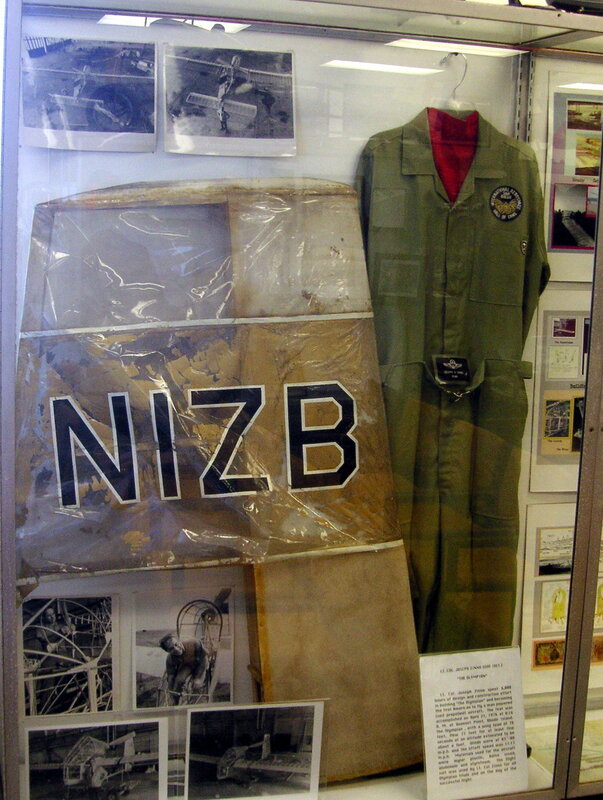 The Federal Aviation Administration issued the Olympian tail number N1ZB. On April 16, 1976, the Olympian made its maiden flight before a small group of reporters at Quonset Point. The first three attempts to leave the ground were unsuccessful, but on the forth try the Olympian rose 12 inches off the ground and flew for 77 feet. This short but historic flight made Joseph Zinno the first American to fly a human-powered aircraft. Throughout the rest of the spring and summer of 1976, Zinno conducted further tests. Come winter, the Olympian was stored in a hangar at Quonset Point, suspended from the ceiling by cables to prevent damage. Unfortunately, one of the suspension cables broke lose causing the ship to crash on the cement floor below. The plane was a total loss, and today, only the tail portion is believed to have survived. 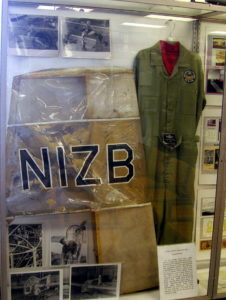 The tail remnant was later put on display at the Quonset Air Museum, along with the flight suit worn by Zinno on his historic flight, as well as photographs of the event. Mr. Zinno had been planning to build another human-powered aircraft when the prize money was finally claimed by a California man in 1977. For his efforts and contribution to aviation history, Mr. Zinno was inducted into the Rhode Island Aviation Hall of Fame in November, 2006. To see photographs, and read more detailed and biographical information about Mr. Zinno, see http://www.globalsolutions-87.com then click on “Hosting Client Links”.